It assesses understanding of concepts, materials and skills used in activity. It assesses conceptual and thinking processes involved in the performance of the activity. This one evaluates students self-awareness and understanding of the content of the activity. Assesses students skills in crafting and organizing their work. This one evaluates time and effort put into completing the activity. 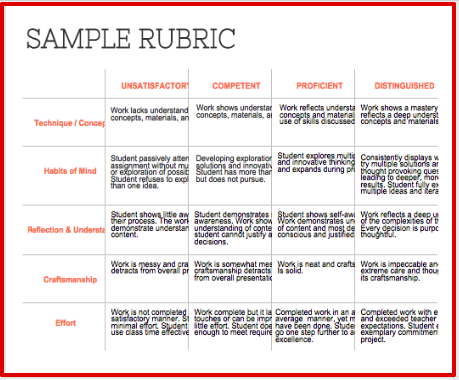 This rubric is available for free download and in editable form from this page. Google Doc version is also available. Enjoy.